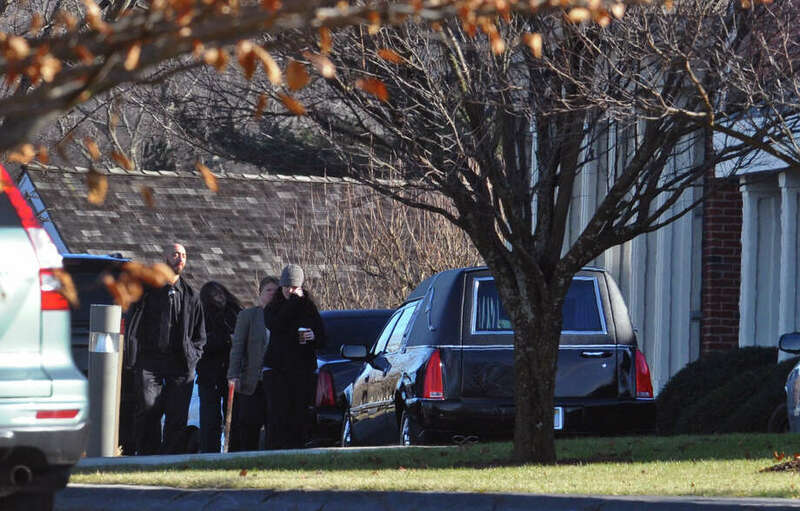 Mourners arrive for the funeral for Sandy Hook Elementary School student Allison Wyatt which was held at Sacred Heart Roman Catholic Church in Southbury Conn. on Thursday December 20, 2012. Allison "Allie" Wyatt was a vibrant, funny 6-year-old girl. She was a budding artist who covered her family's home in her paintings and drawings. She was the kind of child who smiled easily and wouldn't hesitate to share her Goldfish crackers with a stranger. That how Allie, one of 20 children killed in the Sandy Hook Elementary School shootings, was remembered at her funeral at Sacred Heart Church in Southbury. "You are a very fortunate group," said the Rev. Walter L. Pitman, who led the service. "At some point over the past six years, Allie Wyatt got in your way and you are better for it." No family or friends spoke at the service, attended by several hundred people. It was only Pitman, who is actually a senior pastor at another church in Southbury. He said he didn't know the Wyatt family before last week's tragedy, but has spent some time over the past few days getting to know them and their beloved Allie. "She was goofy," Pitman said. "She was funny. She had her two grandfathers wrapped around her finger and she knew it." Allie loved to read, often digging through bags of books. She loved math. "That alone makes her a saint," he said. Pitman said the little girl wanted to be a teacher and worked toward that goal by teaching her sister Lauren to ride the bus. She was, like most children, naturally inquisitive. She was also naturally kind, the sort of kids who could coerce a total stranger to take one of her Goldfish crackers with a simple smile. "Allie didn't need to prompted to be thoughtful and nice," Pitman said. Many of the mourners filing into the church wore green ribbons, which have become a symbol of support for the victims. Not far from the church, a large green ribbon was hung on a gazebo, and trees was adorned with green ribbons as well. Near the end of his service, Pitman encouraged all those present to learn from Allie's kindness and exuberance. "Live your life the way she lived hers," he said. "Be funny. Be goofy. Be silly. Greet each day with fun and a sense of adventure. And, whenever possible, share your Goldfish with a stranger."